" Il giorno che verrà " is a mini rock CD, which marks the return of the Clan Destino, band from 1989 to 1994 of the singer-songwriter Luciano Ligabue. Produced by Luciano Ligabue, the project was premiered on 6 January 2010 at the Fan Club Meeting. The CD opens with a brand new song, " Il giorno che verrà ": it is a love song for the future, for the freedom we have to live to the end what lies before us, a hymn to what awaits us rather than what happened to us. Then 4 totally unpublished pieces, composed between 1992 and 1994. For the Clan Destino this stuff is called history and they thought it was right to share it with those who followed us during all these years. "Lui non ci Sarà" in the version (always demo) totally electric that chronologically precedes the official one, with the acoustic intro that we realized because the electric one seemed too heavy (but listening to it no longer seems so). "Per gli amici" live, captured at the Canguro di San Colombano al Lambro on 8/12/1995 ... the penultimate date of the last Clan Destino tour. Final result: an EP with 7 pieces that traces an ideal line of conjunction between what we have been and what we are now. A sequel and a prequel at the same time for our two albums. Something to remind those who will listen to us that we have roots. Deep and ready to hug anyone who wants it. 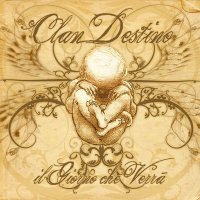 Notify me of updates to Clan Destino "Il giorno che verrà"